Memorial Day has its beginnings at the end of our American Civil War. Soaring and traditionally monumental for a war memorial, Martin Milmore’s monument marks the center of historic Boston Common. ber of individual memorials of the Civil War. "Boston Bronze and Stone Speak To Us" can be purchased at the following locations: Faneuil Hall Book Store, Old North Church Gift Store, Bestsellers Bookstore Cafe, USS Constitution Museum Gift Sore, Museum Of Science Gift Store, Amazon.com, Barnes & Noble Book Stores. I want to share with you, this most kind letter received from Diane Gallagher ; teacher at the Diamond Middle School. What never ceases to amaze me is the broad spectrum of Americans who can relate to"Boston Bronze and Stone Speak To Us"both young and old alike. see our fair city and her public art with new eyes. Now when we venture into Boston on our walking field trip next week with your wonderful book to guide us and our sketch books in hand, we are sure to have a most memorable day! It is no small feat, Joe, that you could keep rapt attention of almost 100 thirteen year old children on a warm Friday afternoon. It was the end of a long week yet they held onto your every word and answered all of your questions thoughtfully. You complimented their answers and made them all feel so good about their knowledge and the inferences they drew about the art. Again, thank you for coming to Lexington to teach our children and inspire us all. 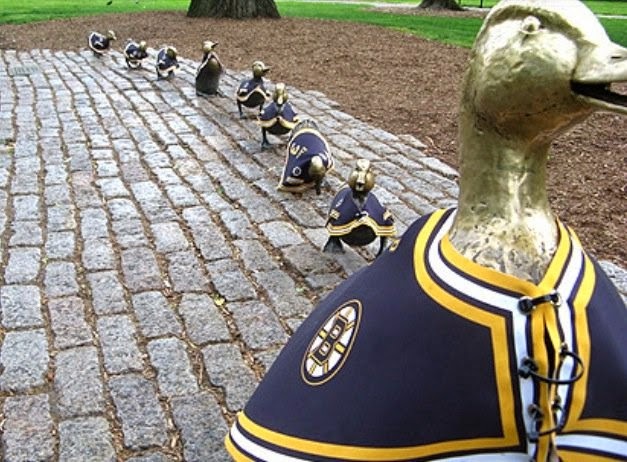 Go Bruins from "Boston Bronze and Stone Speak To Us"
Let's do it again Bruins! Make Way for Ducklings, a children’s book written by Robert McCloskey in 1941, won the Caldecott Medal (an award given annually for outstanding juvenile literature) in 1942. It quickly became a classic, going through seventeen printings and selling more than 700,000 copies. With his own drawings, McCloskey relates the tale of a pair of mallard ducks looking for a nesting site in Boston. They find the perfect place on an island in the Charles River Basin, but they remember the peanuts fed them by visitors to the Public Garden. When the ducklings are old enough, Mrs. Mallard and her progeny take a stroll up sidewalks and through traffic. One of Boston’s newer traditions is a children’s parade retracing the ducklings’ route on Duckling Day (Mothers Day). Requests for replicas in other cities have been turned down by the sculptor because ‘it’s a Boston story.’ She made exception when Russian First Lady Raisa Gorbachev asked her American counterpart Barbara Bush for a duplicate for Moscow; in 1991 a duck family was installed in Gorky Park. Dedicated in the 150th anniversary year of the Public Garden, the sculpture is considered a tribute to McCloskey, whose drawings the sculptor followed closely. Given to the City of Boston by Friends of the Public Garden. Nancy Schön (born 1928) is a renowned sculptor of public art displayed internationally. Nancy prides herself in having work that is totally interactive. Her sculptures are available for people to touch, sit on, hug and interact with every day of the year, day or night. Another major work by Nancy Schön’s besides Make Way for Ducklings is The Tortoise and Hare, which is a meta- phor for the Boston Marathon and is located at the finish line in Copley Square.